From high-end concepts to neighborhood spots and take-out, finding good sushi in Chicago is easy-peasy. Sometimes I like my sushi fancy and with a twist. Chicago has a number of restaurants that take sushi to the next level. One of these, Union Sushi (230 West Erie Street), combines elements of Japanese pop culture, a Kushiyaki menu (grilled meats, veggies, offal), and nice selection of saki with innovative sushi rolls. 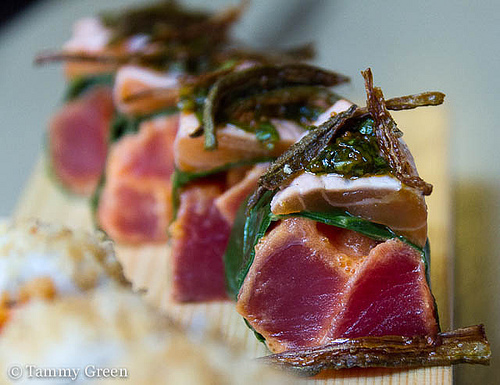 Savor an Old City Market roll that combines spicy tuna, seared salmon, ponzu, cilantro, green onion, fried okra all wrapped up in collard greens. Or try sweet potato, pickled radish and eel sauce in the Devon roll. However you fill your plate, Union Sushi’s see and be seen atmosphere is an excuse to dress up and head out! If a low-key neighborhood experience or quiet date night is on tap, then I head to Sushi Luxe (5204 North Clark Street). It’s a little pricier than some neighborhood spots but consistently better than all. 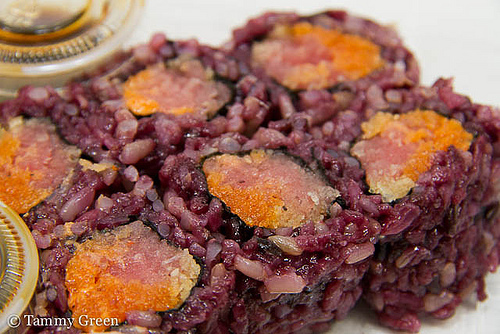 The spicy tuna roll with black rice was so amazing, I went back the following night and had it again. Very fresh, extremely tasty! I’ve never gone wrong with the classic rolls or their bento boxes. If you’re counting calories, they have low carb options as well. There are times I want to plop on my couch, flip channels AND enjoy great sashimi. While there are Chicago sushi places that deliver, I call ahead to Lawrence Fish Market (3914 W Lawrence Ave) for pick-up. This place is a hole-in-the-wall dive, but you don’t go for the atmosphere. 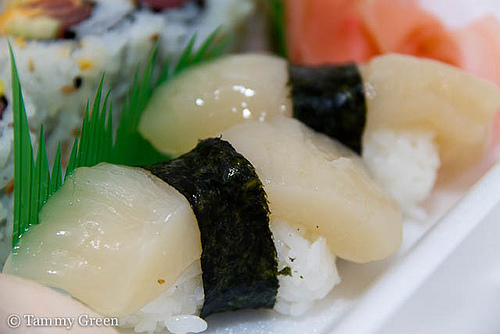 The sashimi and classic rolls are unadorned and come with no frills. I have never been disappointed with the quality or the price — if you plan to spend more than $10, then your capacity for sushi far exceeds the amount I can eat in a meal. This entry was posted in Dining and tagged Lawrence Fish Market, Naniwa, Union BBQ. Bookmark the permalink. Just wondering if you’ve ever found a good place in town to buy fresh wasabi? Wasabi? Hmm…I haven’t really looked. I would check Mitsuwa Marketplace in Arlington Heights.